So if you have been around the home and garden blogs at all the past year or so, you have fast discovered that gray is the new beige… I say that carefully, because I actually was never a fan of “beige”… It was, for me, a boring color that gave no feeling to a room. So of course, I am thrilled that gray has become the new “it” color for neutral backdrops to almost any room. It has a sense of color and style that beige could never measure up to. It can be elegant or edgy. 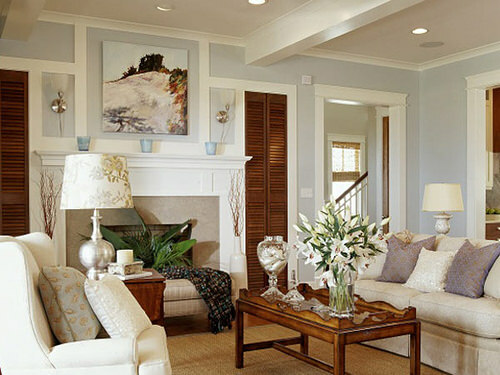 It can cool down a south facing room, add drama in dark tones, or mixed with white can be as uplifting as a beach sky. Here are our top 6 shades of gray paint colors, Benjamin Moore style! Because of the gray craze, paint manufacturers have obliged us with more gray choices that any one person could possible consider…making it confusing to simply choose a color of paint for your walls. What to do? Turn to the very talented home and DIY bloggers to get some recommendations that they have actually used on their walls… Which is what we did recently when we decided to update the front family room. Consider whether you room is well lit… Well lit rooms handle cooler (blue toned) grays better, but still be careful. When in doubt, choose a warmer gray paint color. It will be easier to live with in the long run. Cooler grays combine well with white. Actually, all grays combine well with white, but choose a creamier version for warmer grays. If in doubt to whether a gray is cool or warm, compare it to a blue and yellow paint chip and it will become obvious. Always, always ALWAYS buy a sample, try it on a 3×3 foot square in several different areas of the wall, then observe over different times of day and lighting. Here are our top six gray paint colors bloggers love. We narrowed our choices down from these 6, and the one we finally choose will be going up on our walls. 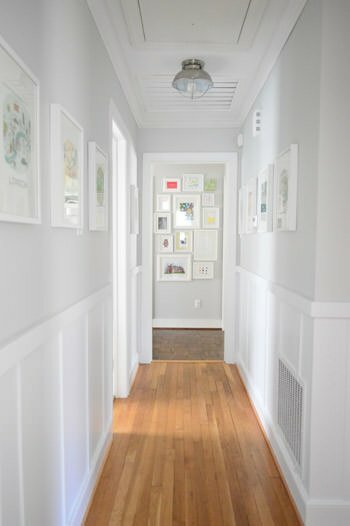 Yes, they are all Benjamin Moore… frankly, for us they just had the best choices for sophisticated gray paint… Hope this helps you all choose to chuck the beige! 5. Benjamin Moore Oyster Shell. Recommended by Emily Henderson of HGTV, (We also chose her number one as our paint color, but thats farther down this list!) this is a light, cool gray that goes well with white to make that fresh feeling. She cautions that grays are tough because if they are too cool they can look blue pretty fast, but this one doesn’t. To prove it, she used it in the room below. Pretty and uplifting! 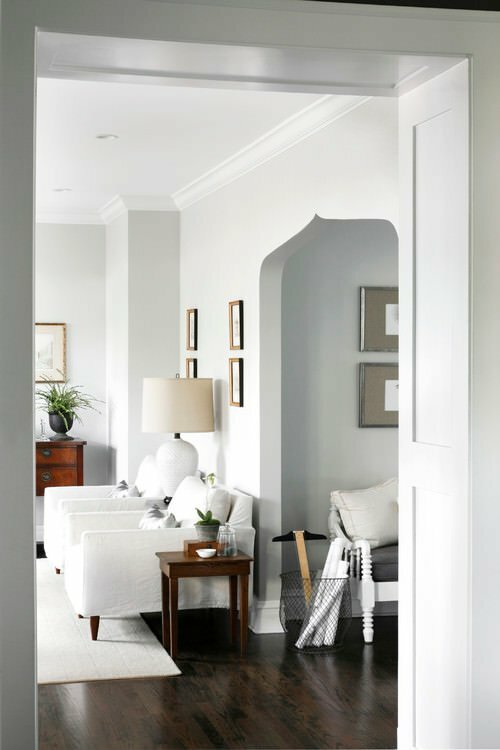 Another gray paint color (cooler) that goes amazing with white… See the photo below from ‘Young House Love‘ to prove it! 3. Benjamin Moore Revere Pewter. I think ‘Young House Love’ initially made this the go to gray , but it’s become popular among a ton of talented bloggers. Mid tone, neutral and easy to live with, this grey is warm without having any olive tones. 2. Benjamin Moore Rockport Gray. I wanted to make sure I include a deeper, more dramatic gray, and Rockport Gray is a great pick. It’s not cold, but definitely more sophisticated with it’s deeper tones… in a darkly lit room, can even look warm and mocha-ey… I think every room should have a drama wall, and adding this color to any of the other choices would achieve that. Love! 1. Benjamin Moore Gray Owl. 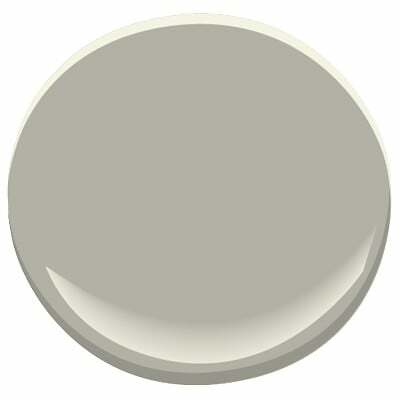 Our gray paint color choice for the family room makeover! This also happens to be a top seller for BM, so we can’t all be wrong! We chose this gray because it’s warm, more a greige… which makes Steve happy ’cause he likes taupe, where I like the grey. It’s kind of a combo of the two…Several other bloggers insisted that this was a very neutral gray, but once on my wall, it was a warm gray with some yellow tones. This photo isn’t our room (not ready for reveal yet!) but it gives you a good feel. 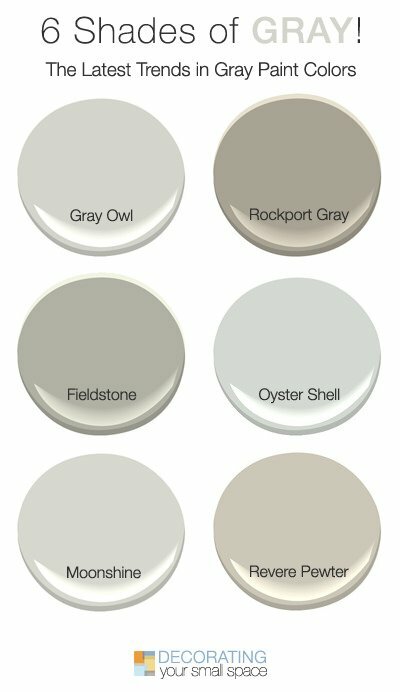 So now that you know our 6 shades of gray paint colors we love the most, we hope you are getting out the paintbrushes! 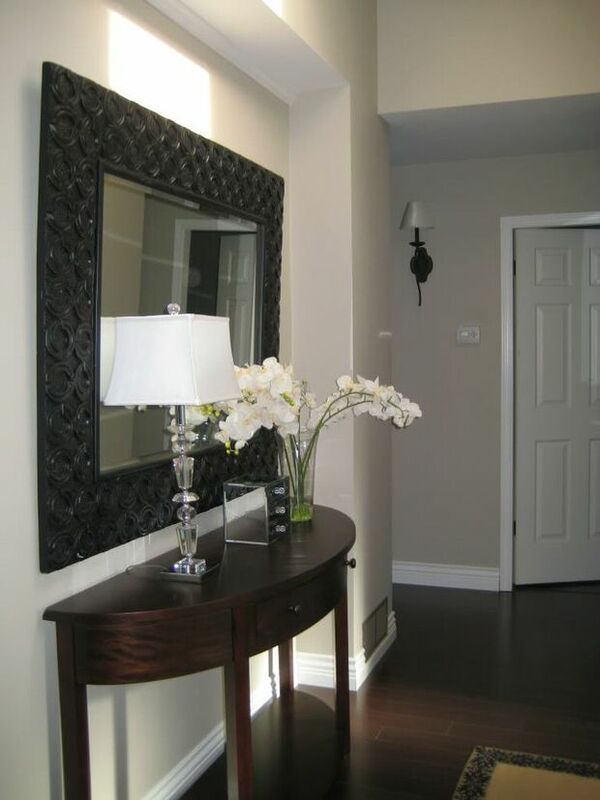 We think you will also enjoy our post on Stone & Brick Accent Walls and Clever Hallway Decorating Ideas! Previous Post DIY Pipe Projects! Next Post How to Reupholster Almost Anything! I will paint my daughter’s bathroom Rockport Grey; what color do you suggest for the walls? I have a dining room that is dark green above chair railing and white below chair railing with a bay window on the north side and the living room is yellow. Both rooms get lots of light. The two rooms are next to each other with a wide opening. I am going to paint the dining room and am thinking of painting it BM Fieldstone above the chair railing. What do you suggest and what white should I use for the trim? im down sizing. building a house. going to go with white cabinets or off white cabinets. Same color trim. Open floor plan with living kitchen dining all in one. Two windows in the front facing southwest. french doors in the kitchen facing north east. Im placing two smaller windows as a back splash on the same northeast facing wall under the cabinets to add more light. i want a neutral grey/blue. i dont like grey. But i dont want it to go to a baby blue shade either. what is a color that is in the middle. I have dark brown toned furniture/ curtains that match autumn colors in a thomas kindaid picture(has a gold frame, 4ft by 3ft picture)that has a misty stream running down the autumn mountains. oranges,reds,greens light blueish white clouds and a dark cabin with fog in the mist. A river. my curtains/furniture is designed around the picture. But since the new house is 1400 sq ft i thought i would paint it neutral grey/blue to make it look larger and lighter but i also want it to go with my autumn colored curtains and furnishings. That to much info? lol …i was looking at Oyster Shell was thinking it matched the fog and creek? I need a trim color and ceiling color. Also i have a 4 year old. who loves pink and blueish color. i need new colors to go in her room that will match up with the rest of the house? ok so how about an overall house color pallet for all rooms lol? 3 bedroom 2 bath. What gray would you recommend painting exterior brick and would you paint the trim a different shade of gray or white? We are using white subway or arabesque backsplash tile with Zodiac stratus white DuPont countertops. We would suggest going with warmer grey, like Revere and Lockport. Hope that helps! 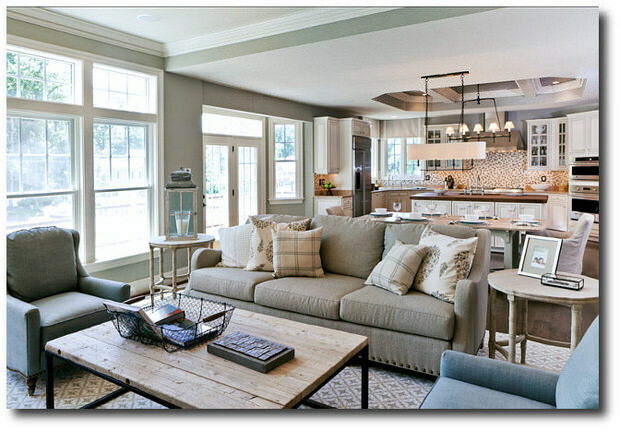 What light gray would you recommend to match up with a hale navy accent wall in a family room? I like the Oyster Shell with Hale Navy, next on my list would be Gray Owl! Hope that helps! I would like your advice on what Benjamin Moore color paint for my kitchen walls. I have honey maple wood cabinets, a grey, white and black with a hint of caramel granite countertop. I wanted to look for a color in the green or gray family. Something not too dark. What color/s do you think will go best? Revere Pewter is a gray that kinda goes with everything, and is not too dark… Hope that helps! I am trying to lighten my room with a new paint job. It is beige now with dark cabinets, med wood floor. Have big north windows, but no south. We are talking a big room wihich is kitchen, dining and living room all in one. I do have white wood work and crown molding. Would love to try a grey, but worried how it will go with a lot of brown in my room..
Revere Pewter is recommended and used by bloggers everywhere for a reason, it works with most colors! Get some swatches and tape them up at different places in the kitchen, against different surfaces. Good luck! Doing my kitchen. I have white cabinets dark warm floors and new caledonia granite. Help!!!! I would go with a warm gray, like “Revere Pewter”… Always a good bet!”Gray Owl” is perfect if you are looking for just a light wash of gray on the walls! We agree with choosing warm grey colors as they will really be better in the long run. We usually recommend this color or have it as one of our main colors for our apartments. What color gray would you recommend to partner with dark to medium oak trim? (not honey) Some areas have much natural light (foyer and office), while others are more dimly lit with a library feel (family room). I would try a sample of Benjamin Moore Revere Pewter… it is a pale gray to not to make your room feel darker, but has some warmth to go well with your wood trim! Good luck! Out of the BM grays which would you suggest for a large whole house color. Exception would be maybe a different color in the formal dining which could be a different grey or another color all together? I like Gray Owl or Revere Pewter… Gray Owl is a little lighter… I would go darker in a formal dining room to set it off!